What is the SR751 Smart RF Repeater? The SR751 Repeater repeats X10 RF (Radio Frequency) signals. This is especially useful if you are trying to cover a larger area with any sort of X10 RF signal. Things like remotes, alarm systems and motions sensors really benefit from the RF Repeater. The unit also has an electrical pass-through at the bottom of the module so you don't even have to lose that outlet! NOTE: The SR751 repeats RF Signals operating at the 310 MHz (X10 Automation) and 433 MHz (X10 Security) frequency. What are the advantages of using the SR751 Smart RF Repeater? What other products work with the SR751 Smart RF Repeater? Any X10 unit that operates via RF Frequency can benefit from the Smart Repeater. 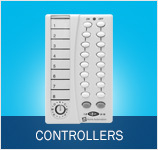 This can be any Wireless Controller or X10 Wireless Security Component. 2. Turn the dial on the SR751 to the 'T' position. Press the TEST button on the Smart Repeater. The Lamp Module should turn on and off for each successive press. 2. Turn the dial on the SR751 to the 'T' position. Press the TEST button on the Smart Repeater. The transceiver clicks on and off for each successive press.